Close to the Gredos mountain range, bordering a nature reserve in the west of Spain, this summer house was designed under very specific demands by the local authorities, only allowing wooden carpentry, pitched roofs and granite stone facades. The design follows these constraints, and responds to the client's desire to collect rain water and offer a large area for solar panels. 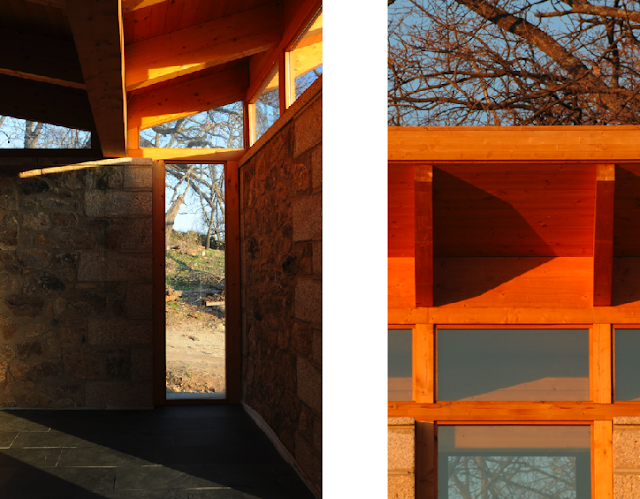 The result was an inverted pitched roof, at angles to allow sun to enter the house in the winter time, and offering shade in the summer, with a large roof surface to the south for solar panels, hidden from view at eye level. Cooling and heating are supplied by a constant 15 degrees Celsius airflow from underground tubes and grey water is stored for irrigation. The project is under construction.